Advent is a wonderful time of year. 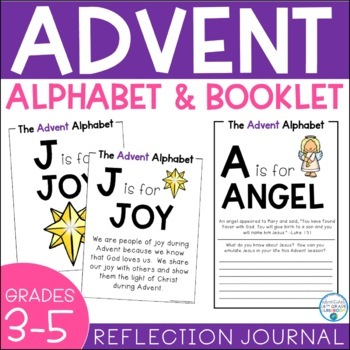 This alphabet and booklet are the perfect way to teach students about Advent, along with having them reflection on their own faith. Each letter of the alphabet has a word and short explanation that is Advent/Christmas themed. Hang the alphabet around the classroom, and have students complete their own booklets. In the booklets students will read about each letter/word and answer the reflection question that goes along with each letter. The download includes 2 versions of the alphabet (just letter and picture & letter with explanation). The booklet includes 28 pages (26 letters, cover, and Advent explanation) and is perfect for students in third, fourth, and fifth grades. The entire product includes both color and B&W printing options.